Front Page » Healthcare » Did Virginia Key become Irma’s dumping ground? Years ago, the barrier island known as Virginia Key was literally a dump, final resting place for everything from empty soup cans to broken chairs, tires to tree limbs. The remnants of dredging also got deposited on the island. Decades passed, policies and priorities changed. The old landfill was capped. A new focus emerged for the future of the island. A big part of this new approach to caring for and improving the island was the creation last year of the Virginia Key Advisory Board. Some board members are upset because new piles of debris are being deliberately dumped on the island, and they fear the growing mountain of refuse could last a mighty long time. 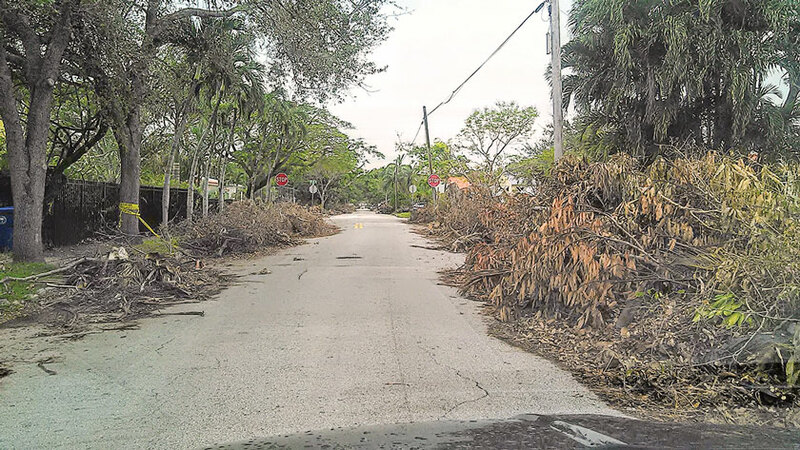 City of Miami officials assure all who ask that the debris dump is temporary, yet the piles grow while tons of storm debris continue to hug the edge of city streets, more than four weeks after Hurricane Irma tore up South Florida and beyond. The issue came up toward the end of the last advisory board meeting Sept. 26. Board member Blanca Mesa asked city officials about the status of storm debris being dumped on the island. “What’s happening with that?” she asked, citing a toxic nature of some of the truckloads of debris that are contaminated with household garage. She also said police are blocking access to portions of the city-owned island, including closing Arthur Lamb Jr. Road to all but the large trucks bringing debris to the north end of the island. “The number one focus is removing the storm debris from the streets, and debris from the yards,” said Kevin Kirwin, director of the city parks department and an ex-officio member of the advisory board. A former mulching site on the island, used in previous hurricanes, has been employed again, he said. The ultimate goal is mulching the vegetative debris from Irma and gradually using the end product in parks throughout the city. Because the island site had been used for this in the past, it was tapped for the latest deposit and mulching, said Mr. Kirwin. Before the storm, state environmental officials tested the site and certified or approved of its use, he said. Once the site is cleared, it will be tested again by the state, according to Mr. Kirwin. “It’s only for vegetative debris. Unfortunately, we’re having to filter out construction and other debris,” he said. City officials have been trying to spread the word for weeks about not mixing household trash or non-storm-related trash with storm debris. Commissioner Ken Russell, whose district includes Virginia Key, posted a video on his Facebook page urging people not to mix the trash. “The South of Flagler team is taking roadside debris to the old mulching and compost grounds at Virginia Key. This is not for garbage, food waste, plastics or construction debris. It is being done with environmental sensitivity while addressing the crisis at hand,” he said in the video. Mr. Russell has also been using his district newsletter and his Twitter account to keep the public up to speed on storm clean-up efforts. Ms. Mesa told Mr. Kirwin she was concerned about Virginia Key being considered for this debris removal and she worried about big piles of garbage attracting rats and other unwanted activity. “I think of all of Virginia Key as a park, all of it. This certainly wouldn’t happen in Regatta Park,” she said, referring to one of the city’s newest parks in Coconut Grove. “Virginia Key doesn’t deserve this anymore,” she said. The roadway did have to be closed to clear the way for the 300 to 500 trips made by haulers each day, Mr. Kirwin told the board. Closure of the road and the hundreds of trips made by the large trucks has seriously impacted one contractor who leases a trailer on the island from the city for recreational sports. Esther Alonso-Luft operates the Virginia Key Outdoor Center from an upland site at Shrimper’s Lagoon, near the old Jimbo’s location. Ms. Alonso-Luft is also an appointed member of the Virginia Key Advisory Board. She told Miami Today, and city officials, she fears for the continuation of her business. Ms. Alonso-Luft said not only did her location not suffer storm damage, it continued to have power after the storm passed. But the closure of the road for the parade of debris haulers means her business is closed, too. She also complains that the heavy trucks are damaging the narrow road and land on the sides of the road. “Everything I have, everything I own, has been invested into growing that business,” she wrote in a response email to Miami Today. “If my business failed because I had a bad business plan or because people didn’t like the services I was offering, I would understand that failure. For my business to fail because the city decided to turn this wonderful park into a dump is beyond alarming … I fear this area will be forever changed. Lost to poor planning and callous disregard for our open spaces,” she wrote. “I do have to thank Daniel Rotenberg and Mark Burns from real estate and asset management who have gone out of their way trying to facilitate a way for me to operate. Currently I am at Marine Stadium under permit, in the former Captain Eddie’s storefront. Unfortunately this is only good through Nov. 30,” she said. Ms. Alonso-Luft said she doesn’t know what the future holds for her business. 5 Responses to Did Virginia Key become Irma’s dumping ground? I’m a windsurfer and I was coming every week-end before the storm. Virginia Key is a beautiful park enjoyed by so many people. Try to keep it clean and back to business as soon as posiible. I’m coming on oct. 21rst for cleaning. I want our park open as soon as possible! I am the owner and operator of Virginia Key Outdoor Center. The volume if truck traffic is not the problem. In fact we vet a lot mire traffic from the boat show and tennis tournament without closures or restrictions. The haphazardous approach to debrus management is my concern. If course of Mr. Kirwin even made an attemot to communicate with me perhaos I wouldn’t be as alarmed. Of course we were all told it was only vegetative debris that would be dumoed at the mulching facility. That clearly was inaccurate. Today the growing 3+ story tall wall of debris contains trees, couches, toilets, doors, bags, buckets, lawn furniture and pretty much anything else you might imagine. The beautiful grassy field has been destroyed. Temporary? How long is temporary and just what is being dumped on Virginia Key? Do you want to spend a day in nature next to a wall of garbage? Why are the 15 acres of land formerly a toxic dump not being used. Trucks removed nearly 1000 mature trees to dump clean fill. Why is that not an option? So far I’ve been told the ground is not stable or that it is still contaminated. Which one is it? This is shameful and terrifying. What would have happened if Miami had been hit with the full force of a hurricane? Would this city be able to recover? This wasn’t our first time at the hurricane rodeo. Why have things gone so terribly wrong. And hey, no more silly excuses. Too bad you can’t just cover the whole mound of crap with sand and concrete construction debris to make taller mountain bike trails. In the 1930’s that’s how they made that great castle mound at Greynolds Park, by burying old tractors and such that were used in the quarry business that was once there. http://bit.ly/2y61dem But of course, these are different times and nothing that easy gets done without first jumping through all kinds of environmental protection hoops.